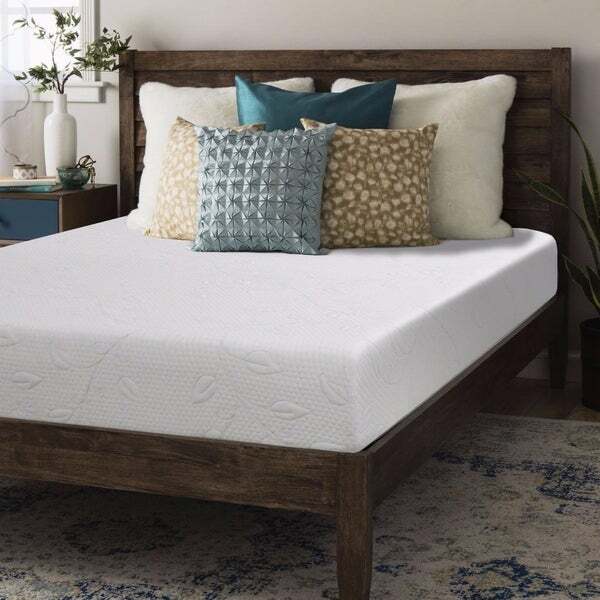 Give yourself a luxurious night's rest with the Crown Comfort Air-flow memory foam mattress featuring a unique three-layer design. The top layer of memory foam conforms to your body to relieve pressure points and distribute weight evenly. The air-flow comfort foam keeps you and your mattress cool and fresh by allowing air to flow in and out, and the base layer provides ample support. This mattress is encased in a zippered poly-jacquard fabric with a non-slip bottom that is removable and machine washable. Seems like more of a 4 inch mattress than an 8 inch. Definitely not 8 inches and since they can’t be sent back or returned I’m stuck with it. When you lay on it, it squishes down to about 2 inches. Glad it’s just for my toddler. We absolutely love this mattress. Great for the price. Comes in a box, as you remove the plastic it inflates. We let ours rest for 48hrs before we actually slept in it. At first it was a bit firm but within a wk or so started to soften up. We bought this mattress with the Priage 9 inch box spring and its just perfect. My daughter loves the bed, says its very comfortable. It came packed tight and I was concerned because the directions said to make sure you unpacked it within 72 hours. Due to schedules it was longer than that before we could set it up, but it filled out beautifully in a shorter time than the instructions said. After a week of use, we are very satisfied. it’s what the description tells you. medium firm and spacious. i love this bed because without the proper support my back begins to hurt throughout the day but not with this bed i get normal amounts of sleep and feel great in the morning. would recommend to someone like me who needs support. We were looking for a comfortable bed for our guest bedroom. After reading several reviews and looking at numerous options we decided to go with the 8" crown comfort. This was the best decision we could have made. The bed is very comfortable and supportive. Within 24hrs it had returned to normal size and it had no odor. Package arrived in a tight box and didn't take very long for delivery. Very nice quality and it was actually 8 inches. The only thing I wasn't happy about was it wasn't as firm as I expected but still very nice. Great mattress, very comfortable. Surprised at how thick it was when the mattress inflates from being in the box. My daughter loved this mattress. She says that she sleeps wonderfully when she gets off from working in the healthcare industry. She states that I am the best mom in the world. This mattress is comfy. We bought it for our guest room, and now we’re planning to order one for our bed👏 There is a bit of scent to the bed so plan to let it air out for a couple days. I bought this for my daughter's room, she absolutely loves it! When our guests sleep in there they always ask about where we bought the mattress, they want one just like it. It's not too firm, not too soft, and does not sleep hot. I'm sure the product itself is fine. I was just SO disappointed at the whole process with Overstock. I made a mistake with my order and realized I got the wrong size mattress. I tried right away to change my order, chatted online with someone from overstock and was told I would have to wait 1-2 business days to "try" to cancel. I sent the unopened box back to Overstock, was refunded but charged the *** shipping fee. This was my first and last time to order from this company. Bought this for my son and he loves it. It is on the firmer side as the description states. We gave it a full 72 hours to expand before using it. Definitely worth the price. Mattress is great! Comfy and just as listed. After a week of use, I’m very pleased with this mattress. After upgrading from a full size, the extra length/width is definitely noticeable. The quality seems to be very good. Considering the price, this mattress is definitely 5 stars. Arrived quickly and was easily unpacked! Sleeps so comfortably! "Does it matter what side it’s on? (Is there a specific “top” and “bottom l”"
The proper placement of this mattress requires the textured side to be facing upright. Yes, there is a 10 year warranty. "Is the wood bed frame shown in the picture available for purchase on Overstock?" I purchased that bed frame about 2 years ago from Overstock. It is beautiful and well made. "Does a box spring need to be used with this mattress?" "How much does this mattress weigh?"